Last updated 15 June 2018 . By Mariah Posey. Leake Street Arches will debut six new venues, including a Vietnamese restaurant and immersive music spot. 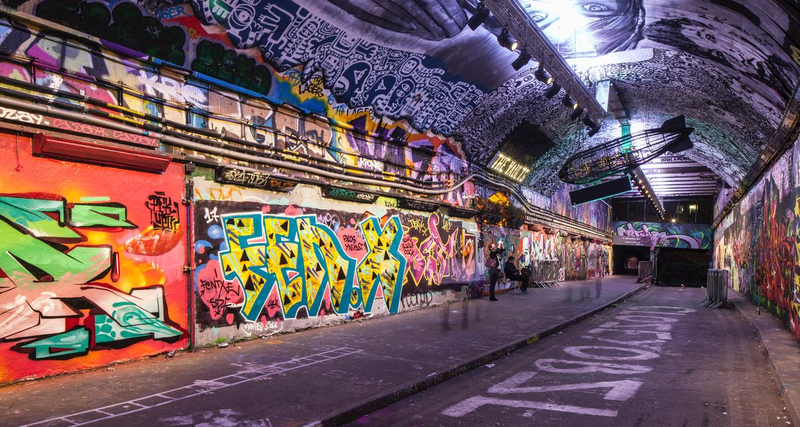 Once declared by Banksy as being a filth pit, Leake Street’s abandoned-turned-graffiti tunnel is taking on a new identity – one that hopes to usher in new life and business, and be less smelly if nothing else. The new spot by the name of Leake Street Arches will be popping up Saturday 16 June, 2018, housing six brand new businesses packed into the street’s empty caverns. Amongst the new venues include Banh Bao Brothers, a punchy Vietnamese restaurant serving fresh food and tahini margaritas, and Aures London, Europe’s first five-sensory immersive music venue. Aures lets you feel the music, literally, with its 50-speaker surround sound system and vibrating floor – as if you were partying in giant headphones. For those concerned that the off-beat tunnel will lose its artsy character, rest assured. Arches’ businesses are well aware of the value in Leake Street’s underground culture. That’s why a large piece by Marc Craig will be showcased in Aures as well as a restored Banksy piece being debuted in the new London boozer, Rat Bar, which plans on serving half-price pizzas to mark its launch. While the Arches have some plans that won’t be seen until 2019 for its underground renewal, its weekend opening is a great chance to get a sense of what’s in store. Just mosey on over from the Waterloo tube station on Saturday to take advantage of free entry and day-long exploration. The Leake Street Arches launches on Saturday, 16th June at Leake Street tunnel, SE1 7NN. Entry is free.